The Cincinnati City Council enacted three ordinances in June 2017 that establish an innovative legal framework to replace the city’s 27,000 lead service lines (LSLs) over the next 15 years. 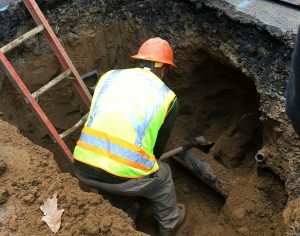 The Council acted after finding that “high levels of lead in water create serious health risks to residents of the City, particularly young children, and using lead service lines between public water mains and properties increases the risk that the lead content of drinking water to the properties served will increase to a dangerous level” and that “replacing lead service lines is in the best interest of the public health, safety, morals, and general welfare.” Although the City stopped allowing new LSLs in 1927, an estimated 1 in 9 service connections still have a portion made of lead pipe. Cincinnati’s program is based on Madison, Wisconsin’s successful effort, which began in 2000 and was completed in 2011. Cincinnati is roughly three times larger than Madison in terms of population, service connections, and LSLs. Under the program, residential property owners within Greater Cincinnati Water Works’ (GCWW) service area can receive between 40 and 50% off of the cost of replacing the portion of the LSL on their property up to $1,500 if they agree to have GCWW arrange for the replacement. Owners within the limits of the City of Cincinnati may choose to have the remaining cost assessed semiannually on their property tax bill and repaid over 5 or 10 years. Property assessments must be approved by the political entity where the property resides. As of today the assessment option is only available for the residential properties in the City. However, GCWW is reaching out to the other jurisdictions it serves to discuss expanding the assessment program to those jurisdictions as well. GCWW will also be replacing the portion of the LSL on public property so that the entire service line is replaced. The City is committed to fund its share of the work from GCWW’s Capital Budget.